Back in mid-October, I requested an interview with Under Armour. I was keen to delve into the future of the HealthBox suite, the intriguing, interlinked trio of fitness tracker, heart rate monitor and connected scale that launched in 2015. How was that seamless, all-in-one approach going? And would there be a second generation or additional products we could look forward to in the near future? For a reason that eluded me at the time, the firm wanted to wait until after its quarterly earnings call before committing to a chat. What have earnings got to do with it, I thought? Then it became clear. During that earnings call, Under Armour revealed it was dropping HealthBox. It would still sell the products until the end of 2017 (at a heavy discount), but there'd be no sequel. In fact, there'd be no traditional wearables at all moving forward. Instead the firm was doubling down focus on its powerful app suite, integration partnerships with companies like Samsung, and the potential for embedded tech and unconnected apparel to enhance the digital experience. "I think the market has evolved and we've evolved with it," Paul Fipps, UA's chief technology officer, explains to Wareable. "In 2015, when we started to develop the concept of HealthBox, there were a lot of wearable devices out there that weren't designed to work together. "Our thinking was could we develop this holistic system to give people an end-to-end, deeply-connected experience. Whether it was tracking heart rate during a workout, tracking sleep using the band or weighing in every day. I think we achieved that." The full extent of this achievement is debatable. HealthBox was not a well-reviewed product and fell short of its promise, as Wareable editor Michael Sawh pointed out earlier this month. However, for Under Armour, there doesn't seem to be much mourning of HealthBox. Valuable lessons have been learned and the company's focus remains super-trained on its vast digital community, which continues to grow under the banner of the UA Record app as well as its MapMyFitness, MyFitnessPal and Endomondo suites. "Our strategy has always been about the community and software," Fipps says. "Even when we developed HealthBox, we still had an open, agnostic platform for any of those connected devices because we believe in the power of the community and the apps." Despite the decision to consign its own HealthBox tech to history, the firm's presence in wearables is broadening, thanks largely to a partnership with Samsung. Optimised versions of the UA apps are built into Samsung's latest wearables, the Gear Sport, Gear Fit2 Pro and the Gear S3. The accord with Samsung could even spawn new UA-branded tech. "I think we're learning a ton from Samsung," Fipps says. "If you go further, they bought Harman last year. We've been doing some unique things with Harman as we develop this joint product around headphones." A hearable device, perhaps? "Stay tuned on the Harman stuff," Fipps hints. "There's some pretty neat stuff out there." Under Armour's pivot from wearable tech comes as it continues to build towards embeddables; everyday fitness products that have powerful sensors built-in. As an apparel manufacturer first and foremost, this will help it sell more shoes, while integrating with and fostering loyalty among the digital community it serves. This was always the plan, Fipps says. The innovative Record Equipped shoes are currently in their second generation. They have a built-in chip that facilitates a simply jump test – called Jump Around – to assess how ready your body is to work out. They'll also track time, distance, cadence and splits. "We always knew, from a strategy standpoint, that we'd be moving from wearables into embeddables," Fipps says. "Having this connected experience with footwear amplifies our apps and communities and gives us a unique advantage around digital and physical products coming together." In spring 2018 the third edition of the Record Equipped will provide a "quantum leap" that's akin to a "new first generation," the CTO tells us. They'll introduce a next-generation sensor that tracks pace, cadence and distance and shoe life. They'll also be the first shoes to include UA's new HOVR cushioning technology, which promises a combination of energy return and impact absorption. Of course, all of that information will be synced back to the digital realm. Among the unconnected apparel is the TB12 sleepwear, a $200 shirt and bottoms combination, developed in association with the New England Patriots' five-time Super Bowl Champion quarterback Tom Brady. Geared towards maximising recovery from activity, the Tommy B jim-jams use far infrared waves to absorb body heat and deliver it back to your body. The science says this can reduce inflammation and ensure a better night's sleep. While users can't draw any data directly from the garment itself, the story should be told by improvements they see within the app or device use to track sleep. "We're realising it doesn't have to be a connected experience," says Fipps. "The combination of the physical and digital experience is really resonating." Rather than simply writing HealthBox off as a failed experiment, Under Armour says it has learned enough from its flirtation with wearable hardware to power its key goals in the digital space moving forward. "What we've learned and what we're focused on is that people want a very clean and simple experience," says Fipps. 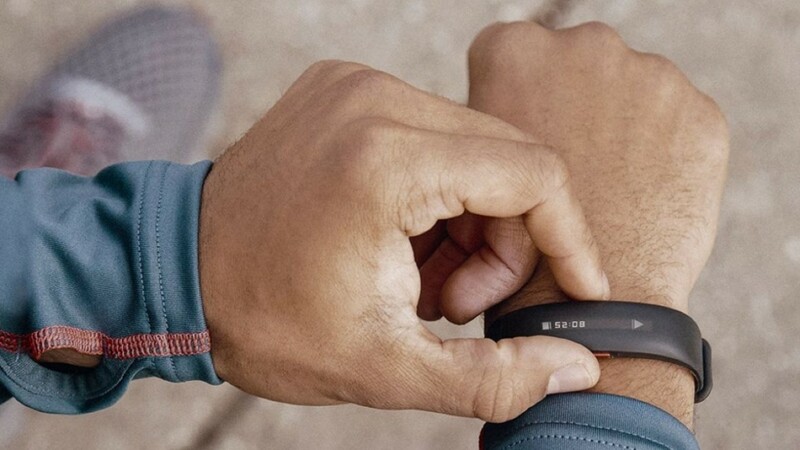 "I think when tech gets in the way of your workout, it makes it not useful. Users want to measure themselves and improve. You can see that in our apps. Whether you're tracking runs, training workouts, food or sleep, it's the seamless experience people are looking for." Indeed, Under Armour's withdrawal from wearable hardware isn't necessarily a statement about the immediate health of the sector. Fipps says there's still a "lot of runway" for companies to explore with dedicated wearables, but eventually they won't be required. "I think the wearable tech will evolve so that it becomes invisible to you," he adds. "I don't know what that will look like, but I think that over time customers will expect that it becomes embedded in something they're already wearing and using." The ongoing overall goal for Under Armour is to continue talking to customers in a different way. Through the HealthBox experience it learned new ways to communicate with its athletes, while affirming its view that bombarding enthusiasts with too much information can actually be detrimental. "People are moving really quickly in the digital world," Fipps says. "What's created is companies that are trying to keep up with these people. Inadvertently they're bombarding them with a lot of information that's not really relevant. Consumers get information overload. Too many options. Too many choices. "I think what the wearables helped us to do is really understand how we can collect more info and give people a better view of what they want to measure. We've learned a ton there, whether it's sleep, nutrition, activity or fitness."